Attach this splitter to a existing C13 connector, PDU and save space for multiple or over-sized adapters or other cords. Attach this splitter to a wall outlet, power strip, or other UPS supply and save space for multiple or oversized adaptors or other cords. 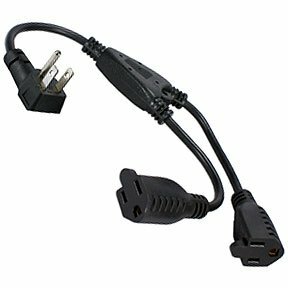 Provides an extra 5-15R outlet from computer, monitor, television or any other devices that uses an IEC320 C13 connection. Can be used to place devices closer together such as chargers, cable/satellite boxes, game consoles. When you require a short Power Cord Splitter; our 1 ft unit is the right choice. Its 14 AWG wire is long lasting and rated to handle up to 15 amps. UL listed. A range of power cord splitters are available at SF Cable. You can order and get them delivered at your doorsteps. We have Splitter Power Cord IEC 60320 C14 to NEMA 5-15R x 2 SJT 16 AWG 13A/125V, 16 AWG NEMA 5-15P to 2 NEMA 5-15R Outlet Saver Power Cord Splitter, 4--Outlet Power Cord Splitter NEMA 5-15P to NEMA 5-15R 16 AWG/3, 16 AWG 1-to-2 Power Cord Splitter SJT (NEMA 5-15P to 1 NEMA 5-15R + 1 IEC320), 14 AWG NEMA 5-15P to 2 NEMA 5-15R Outlet Saver Power Cord Splitter, Ultra Low Profile Angle NEMA 5-15P to 2 NEMA 5-15R with 12" 14/3 AWG SJT 15A Black, and 90 degree Flat-Plug Outlet Saver AC Power Splitter Adaptor, available in various lengths. Our products define quality and promise user satisfaction. All products at SF Cable are RoHS compliant and environmentally friendly. Competitive prices and commendable after sales services is our specialization in the market.